The ‘common’ strawberry (Fragaria × ananassa) is a popular fruit in Korea and is often consumed fresh. Polyploidy is common in horticultural crops, and Fragaria × ananassa is octoploid, having 8 sets of each chromosome; however, the molecular genetic information of octoploid strawberry is still insufficient to develop effective markers for agronomic traits. In this study, a set of high-quality single nucleotide polymorphisms (SNPs) was collected via the genotyping-by-sequencing (GBS) method to genotype the strawberry inbred lines developed in Korea. We used a population of 89 strawberry inbred lines, which were derived from nine strawberry cultivars. The FANhybrid_r1.2 octoploid assembly was used as a reference genome. The average length of reads was 87,458,702 bp, and a total of 437,058 SNPs were collected. Several filtering criteria (SNP quality, read depth, and genotype quality) were used to identify 20,923 potential SNPs. Finally, 2863 high-quality SNPs were selected for the study. The genetic diversity of the inbred lines was analyzed by phylogenetic tree and structure analysis using the SNP genotype data. 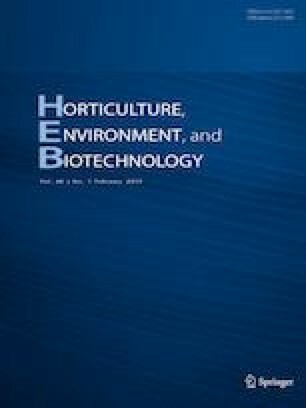 This is the first report of genotyping strawberry inbred lines using the GBS technique, and can be used to accelerate strawberry molecular breeding. The online version of this article ( https://doi.org/10.1007/s13580-018-0100-5) contains supplementary material, which is available to authorized users. This work was supported by grants from the Export Promotion Technology Development Research Programs (315047-3) funded by the Ministry of Agriculture, Food and Rural Affairs, Republic of Korea.